Retromags Presents! 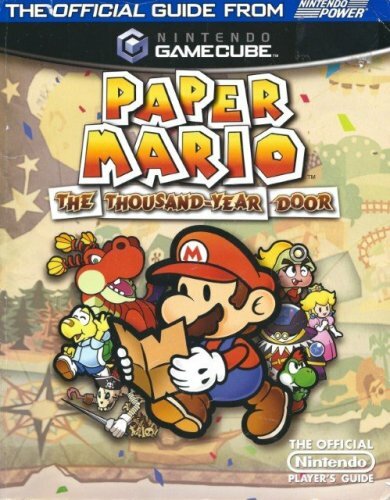 Paper Mario: The Thousand Year Door Database Record Download Directly! Scanned By: Sternosaur Edited By: Sternosaur Uploaded By: Sternosaur Subscribe to our New Release Feedburner email! Okay good to know, there's another thing that bothered me btw, when I scanned them perfectly against the corner of my scanner it still looked like the image was at a slight tilt or angle due to the pages or where I took the pages out of the binding, it's left with these frill looking things sticking out where it was in the binding. I did a ton of touch up on the actual pages themselves I just haven't for the cover, I just became super self conscience about mine after looking at the latest magazines that got scanned. I'll clean up the top a bit more, but I should probably hold off on declaring this thing complete until I can rescan the back of the cover with the sticker off. Rookie mistake. I peeled off the sticker carefully and it of course uplifted a tiny bit of the yellow background but nothing I can't digitally fix. Currently my digital version looks a lot better than the actual condition it's in, recreating some of the corners where a page was torn was a pain but rewarding. I didn't know if it would get accepted but glad to know you guys also put in the time to do that. If I may ask, is there a specific copier you suggest for the best results, as I need to get a new one anyway. I don't know how to put the pages in WIP or PDF format btw but I put it in CBR format and have the pages uploaded separately but provided them in one 7zip file. If there are any changes that I need to make please let me know. I'm sure I could clean up the cover a bit more digitally but I don't know if that's frowned upon if I have to digitally remove any blemishes since this wasn't a brand new guide I debinded. Okay thank you, I'll edit the files according to the guidelines and put them into the .cbr format. My friend's hair dryer is on her last leg so I'll have to get my own. If I were to list my favorite Star Wars movies from best to worst, they would have to be Star Wars Episode IV - A New Hope Star Wars Episode V - The Empire Strikes Back Star Wars Episode VI - Return of the Jedi Rogue One - A Star Wars Story Star Wars Episode III - Revenge of the Sith Star Wars Episode VII - The Force Awakens Star Wars Episode I - The Phantom Menace Star Wars Episode II - Attack of the Clones My reasoning for this is, if I'm getting to the point, is that episodes 4 5 and 6 have the most consistency throughout the movies. Rogue One explains how they got the plans to the death star and how the Rebels could figure out how to destroy something so massive.. I loved Rogue one and have already seen it 3 times in theaters. I loved the action in Episode 3, I get goosebumps every time I see the final battle. Star Wars Episode 7 just.. idk, I saw it multiple times in theaters, it got great ratings, I love it for bringing the Star Wars franchise back, I just didn't think it was as great as so many people claim it is. Star Wars Episode 1.. Jar Jar. Star Wars Episode 2 just felt like a love story. Sternosaur replied to Areala's topic in Retro Video Gaming! Sorry, you guys just let anyone edit including new members? I'd be happy to help edit, I have experience animating with studio pro 8 and editing with paint.net, which is pretty much like photoshop, I just don't have photoshop. What do you do to these scans in particular, just make sure they're all straightened out and have the same lighting? I have an interest I just don't know where to apply towards editing scanned magazines. Thank you so much for the video, I was looking for something like this! I'll make sure to save this. On the front of the cover it says Sonic Adventure vivid expose. This is the first magazine I've ever seen mention Sonic Adventure on the front cover, however I have yet to get to the Sega magazines yet. I'm not even sure what Sega called their magazines, but back then yeah I'd expect games to first be announced through stuff like this, nintendo power, etc. before I heard about it on the internet. I know there was a limited edition of Sonic Adventure that people could rent from hollywood video stores before the initial launch, I just don't know when the game was first announced or revealed, or through what. Sternosaur replied to Data's topic in Current Generation Video Gaming! Yeah I guess that's true, I guess it's different for me since I have time to kill inbetween classes at college so for me this means taking my switch to school while waiting for class and since I live in the city I'm better off staying at college for an additional 2 hours for traffic to die down, do homework, and play the Nintendo Switch while waiting. I have disability and the post 9/11 GI Bill so college for me basically is part of my income haha but for those who take public transportation or waiting for a flight, or even if you're just going over to a buddy's place, it's going to have two controllers at all times for local multiplayer, so idk I just hope it does well and succeeds. They only have up to 169, not all of them.